Did you know that you can improve the efficiency of your home’s climate control system with aftermarket products just like you can on your car? While your HVAC system should be adequate for heating and cooling, you can also improve the quality of the air it blows through your ducts and around your house. One example of those aftermarket products is called the Air Scrubber Plus. It is an amazing device that can help to significantly improve air quality in the home, office, or any other interior. This system can offer significant health benefits, and is an upgrade that most families, businesses, and homeowners would be better with than without. The Air Scrubber Plus is essentially an integrated system that provides 24/7 purification for your entire dwelling. It works by cleaning, freshening, and then purifying air via the use of UV light waves. These are able to eliminate a number of the germs and bacteria that are responsible for many health problems caused by unclean air. These light waves are combined with a proprietary catalytic process, which uses two enviroscrubbing molecules: oxygen and hydrogen. In short, it uses a combination of both passive filters that clean the air as it passes through them, as well as ActivePure scrubbers that remove chemicals, contaminants, mold, odors, pollutants and more. It works as soon as you turn on a furnace, fan, or air conditioning system and it significantly reduces the amount of spraying and scrubbing and dusting that you need to do yourself. 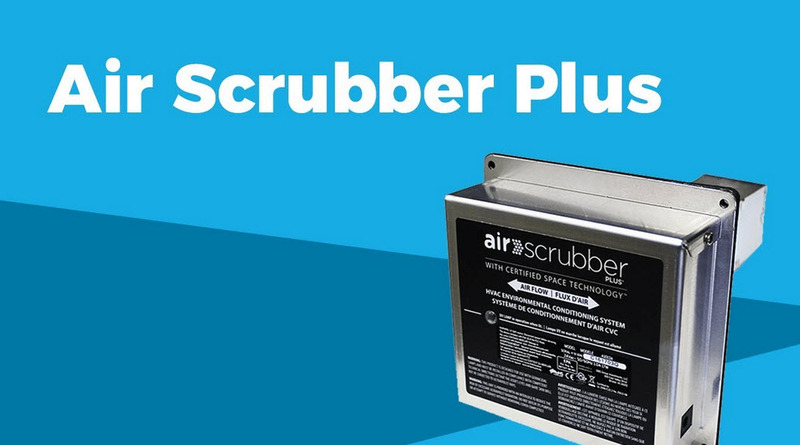 So why use Air Scrubber Plus? Firstly, it can significantly improve you and your family’s health. Many of us don’t think about the amount of unwanted contaminants floating around in the air that we breathe on a daily basis. That’s partly because it doesn’t really bear thinking about. However, a typical single breath of air will contain dust, smoke particles, bacteria, mold spores and more. Consider that dust for a moment. Do you know what dust is primarily made up of? Skin! It’s a horrible thought, but those tiny specks you see hanging in the air are the tiny bits of dead skin that you, your family, and your guests have shed. In addition, anything you smell is actually particulate that has made its way to your nose. But, we are not done yet. The sheer amount of bacteria that the human body carries is quite spectacular. We actually have more bacterial cells than human cells. And while these don’t typically cause us any harm, they do cause harm to others that breathe them in, seeing as they have an entirely different makeups and haven’t become accustomed in the way that you have. In short, swapping this airborne bacteria can make you and your loved ones ill. And, everyone is breathing in thick clouds of it! That’s before you consider the fact that there is probably mold somewhere in your home, which releases small spores into the atmosphere for you to breathe. These then attack your immune system making you feel lethargic and more susceptible to illness. And how about the air pollution from outside? This can be an issue for even healthy individuals, but those with asthma and eczema stand to suffer even more. The same goes for pet dander and pollen. Is it any wonder that you wake up feeling groggy and low on energy? The simple fact of the matter is that our homes are not natural. We did not evolve to live in such close, enclosed quarters. And as such, we keep getting ill.
Something like the Air Scrubber Plus can really help. What’s more, is that Air Scrubber Plus can also help you to extend the lifespan of your air conditioning systems, furnaces, and other appliances thereby saving you money too. At the same time, the Air Scrubber can also reduce the amount of work you need to do to maintain your home and keep it clean and tidy. Adding an Air Scrubber to your home’s HVAC system can make your quality of life much better as well as help save you money over the long-term. There are other HVAC addons as well that you might want to consider, such as dehumidifiers, carbon monoxide alarms, ventilators, and more. If you’re interested in optimizing what your home’s HVAC unit can do, make sure to contact your local HVAC services company and see what they have to offer.